A few weeks ago, the "pros" on Wall Street started freaking out – about interest rates. 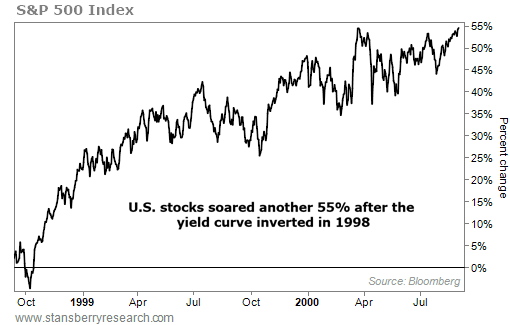 Specifically, they freaked out about "yield curve inversion." Yield curve inversion is when long-term interest rates fall below short-term interest rates. As longtime DailyWealth readers know, it's often an early warning sign that a recession is on the way. That finally happened in March... And the world is now using it as today's fear du jour. An inverted yield curve does matter. It is a big deal. But the funny thing is, the "pros" on Wall Street have it all backwards. The yield curve inversion that happened late last month isn't a reason to fear. It DOES NOT mean we should head for the sidelines. It means we should step up to the plate and take advantage of this opportunity... before it's too late. Long-term interest rates should be higher than short-term rates. That's the natural order of things. And it makes sense. If you're locking your money up for 10 years, you should demand a higher interest rate than if you're locking it up for only a year or two. The reduced flexibility (and heightened risk) of long-term bonds should come with higher yields. You see, long-term rates are controlled by the market, while the Federal Reserve controls short-term rates. If the Fed artificially pushes short-term rates higher, it slows down the economy. And it's usually a sign that a peak is coming. The question we need to ask is this... What happens next? 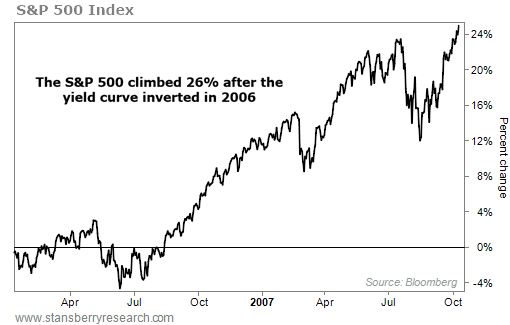 Stocks weren't anywhere near a top in early 2006. They went on to soar 26% over the next 21 months before hitting their peak in October 2007. This doesn't even show the massive 210% gain in the tech-heavy Nasdaq Composite Index over the same period. Tech stocks soared during the final stages of the last great bull market. The story that comes out of these numbers is incredible. It doesn't tell us to be worried. It doesn't tell us to panic and move our portfolios to higher ground. History says it will probably be a year or more until stocks eventually peak. And we'll likely see big gains between now and then. That's why today, I urge you to follow the same advice I've given throughout this incredible bull market... Stay long. Steve and his team track a different yield curve: the spread between 10-year and two-year yields. Importantly, this yield curve has not inverted yet... Review how it works as an "early warning" indicator – along with another gauge you should watch today – right here. "Ten years is a long time for a stock market boom. No question," Steve says. But as he explains, bull markets don't come with an expiration date... Learn what this decadelong boom means for your profits today right here.